When you’re having a baby, you want the most accurate, reliable information possible. Yes, you want advice and knowledge from experts—that’s a given, right? You want to know what to medically expect, what is scientifically happening to your body and your baby, and how the birthing process works. A good doctor can tell you all about it and answer all of your questions. But you also want to hear it from someone who’s been there, done that. If your OB/GYN is a male, that’s not likely to be the case; and even if not, you don’t want worries or concerns smoothed over—or worse, the experience to be ballooned out into some insurmountable fear. You want to hear some friendly truth-telling from a mother who knows what labor is like. Once upon a time I thought I would like to be a midwife when I grew up. And then I grew up, had a baby(by c-section) and realized, um, maybe not. But it was this book, that I read in my late teens, when I knew nothing about life that convinced me that I could deliver babies. 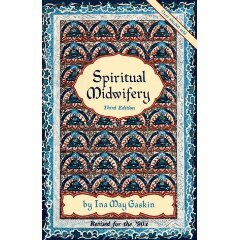 Spiritual Midwifery by Ina May is a wonderful book about women who opt for natural delivery in a natural setting. In this case it was the women of a rural commune who out of necessity were forced to learn to deliver their own babies.